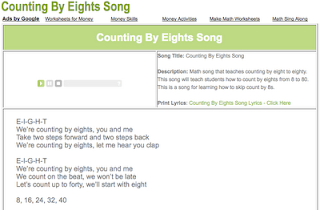 The Counting By Eights Song is a math song that teaches counting by eight to eighty. This song will teach students how to count by eights from 8 to 80. This is a song for learning how to skip count by 8s. When your kids listen to this counting song, they will be singing and dancing while learning how to skip count by eight. This song will also help your kids learn how to multiply by eight. This counting song will help kids learn how to count by eights and will get them ready to have fun counting!